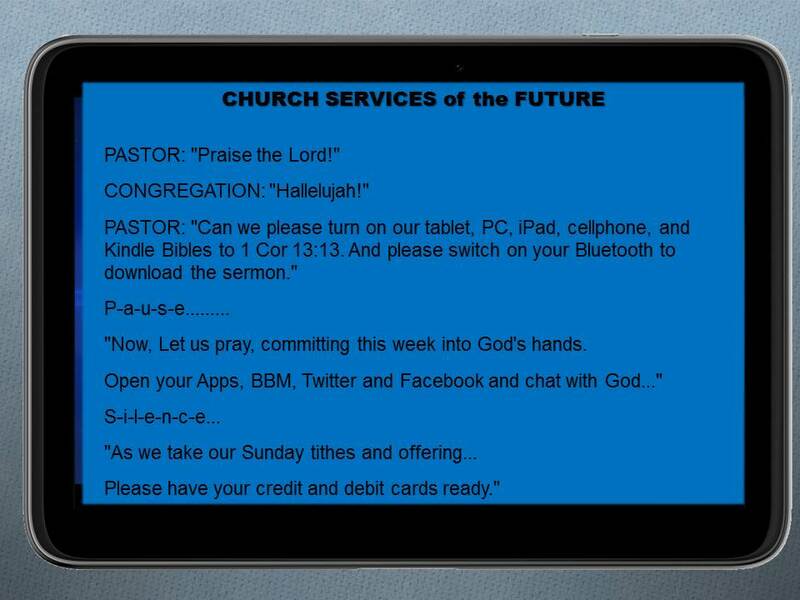 Someone shared this with me in an email titled: Church Services of the Future. (It can also be found at places other than FreeRepublic.com. I believe the idea behind the email (I was among a good number of recipients) was to engender discussion of the ways technology is, or seems to be, or threatens to be, infringing on worship. My first thought was that this was posted by a traditionalist, strongly opposed to any technology in worship. Of, by that I mean (or the traditionalist means) opposition to any recent technology in worship. I assume, anyway, that there is not widespread opposition to the use of electricity – whether it be in the lights or sound system. FYI, I am not, at least in the technological sense, a traditionalist. Neither am I one who insists that proper, relevant worship of God must be on the cutting edge of technology. God has no more (and no less) issue with your being distracted from worship by your smart phone than by worrying what that other person is looking at on her smartphone. When I was a youth, we sometimes passed notes to one another during the sermon. Offering envelopes served well for this. When caught, we were admonished that we should be paying attention. I don’t remember whether or not the notes were ever related to what the preacher was saying or not. I know people who taking notes on their phones or tablet computers during sermons. Is writing notes on by hand more worshipful than writing them electronically? Not a chance. Worship is about worship – worship of God. It is not about technology – whether that means for technology, or against it. I’ve taken to making a video of the sermon on my smartphone for further reflection later in the week. I certainly hope it isn’t distracting. Not distracting to me – I had no idea you were doing so!